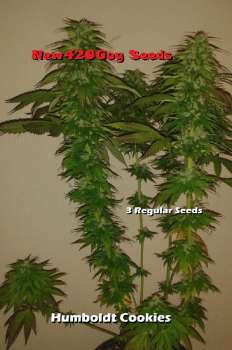 Here you can find a strain description about Humboldt Cookies and also some user-based reviews and infos directly from the SeedFinder (if available). You can also find the offers and auctions here if Humboldt Cookies cannabis seeds are on stock at MyCannapot right now. Although susceptible to mold with over watering, this kush /sativa cross (20% indica / 80% sativa) is a heavy yielder, indoors or outdoors. We see two pheno types here, but most have a strong kush aroma with thick long colas and lots of buds close together. The other pheno resembles her father, Girl Scout Cookies Original Thin Mint. Good for relaxing, insomnia, nausea or stress. Flowering period is 8 to 10 weeks. Buy Humboldt Cookies now at MyCannapot!